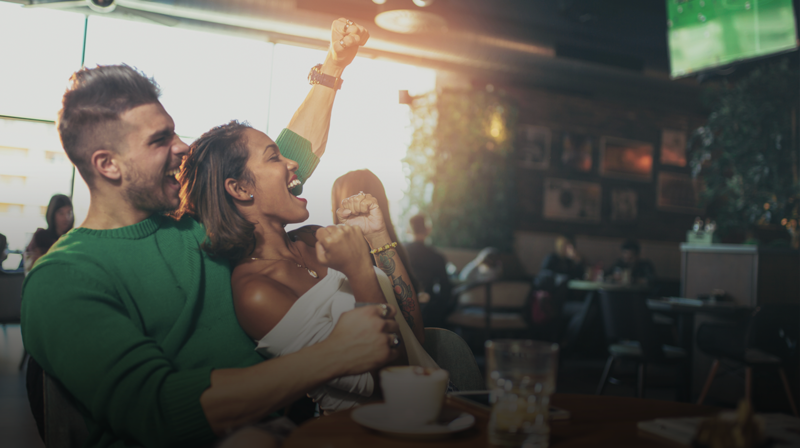 In this post, GlobalWebIndex's Senior Trends Analyst, Katie Young discusses why the 'second screen culture' offers a huge opportunity for brands to engage fans on social during live sports events. Live sport remains one of the only types of content for which viewers will make an appointment to view. But in a splintering media landscape, this faces a growing challenge from ‘cord-cutting’ and the potential shift of viewing behaviours online and towards social. 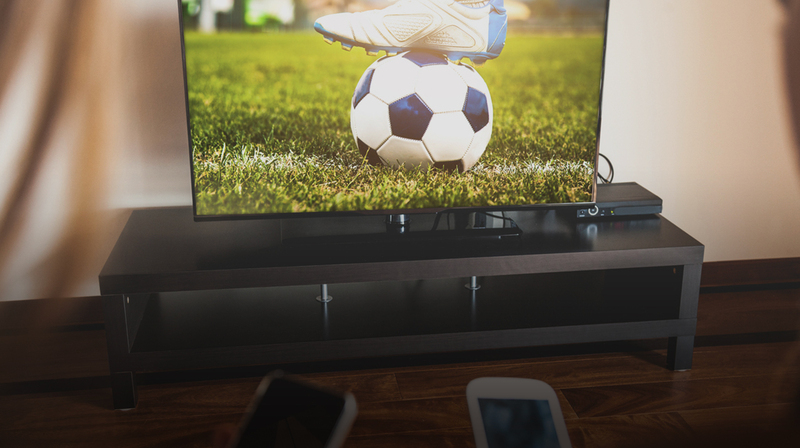 For advertisers and marketers, though, another great challenge presents itself in the form of the second-screen, with many sports viewers turning away from their TV sets during the commercial breaks. So how can marketers and brands hope to engage sports fans on their second-screen? Whether it’s looking to find out friends’ reactions to a big game, what pundits are predicting for the second half, or searching for information about a certain athlete, second-screening has long had a big role to play in sports. 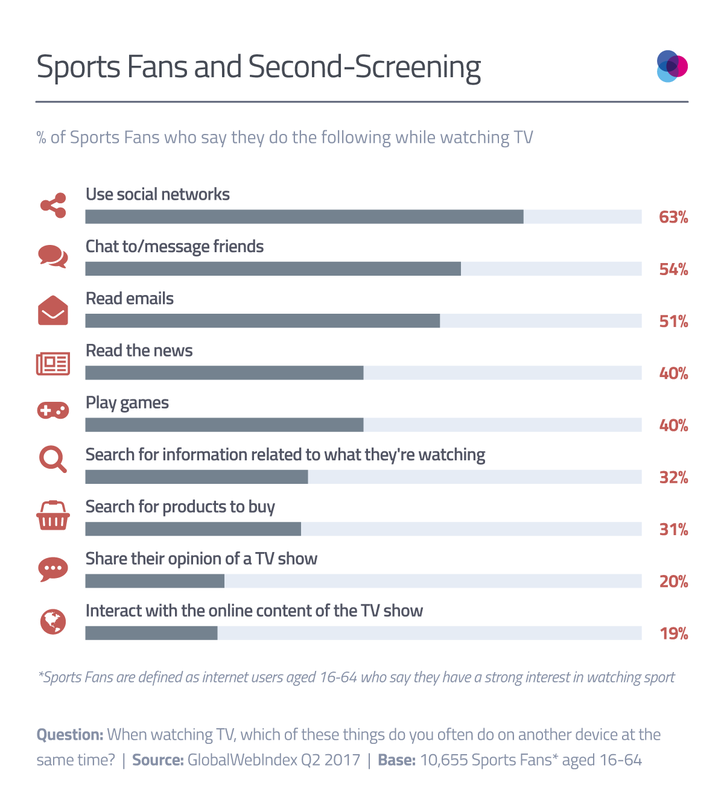 In fact, among those with an expressed interest in watching sports, using another device while watching TV is virtually universal (96% report doing so), with most reaching for their mobile (74%). Sports fans aren’t necessary looking to engage with related TV apps or searching for products to buy during this time. Rather, it’s social where the majority head. Over half of sports fans say they use social networks while watching TV, with a similar proportion saying they message their friends. Evidently, they’re looking to connect with other fans, see friends’ reactions to matches in real-time, as well as feel the adrenaline of the crowd. Twitter has a major opportunity here. Live tweeting and reactions from sports broadcasters and journalists means that Twitter is a natural go-to for live sports commentary and updates. Outside of China, half of sports fans are visiting Twitter each week, and with over a fifth of these visitors saying they have tweeted about a sports event or match they were watching, the desire to be part of the big conversation is clear. For brands hoping to reach sports fans on the second-screen, then, the key is to maximise the digital footprint of a campaign. There’s no denying the reach of social (our data shows that virtually every internet user is now a social networkers) and the cost-effective opportunity it offers to be part of the conversation. But the answer is not pasting ads and promotional content all over social. Instead, it’s to cleverly become part of the conversation, without getting in the way of fans accessing the commentary and updates they want. Gambling site Paddy Power is one brand that has capitalised on moment marketing on social. By posting topical jokes and memes that earn countless shares, it manages to keep its brand at the forefront of people’s minds as they watch the game. And although some time ago, one of the best examples of marketing moments of all was at the 2013 Super Bowl, when Oreo capitalised on the massive power outage with its ‘You Can Still Dunk in the Dark' tweet. All in all, second-screening will undoubtedly create more views to advertise against, but big sports events are not necessarily the time to be pushing out ads or excessive promotional content. Rather it’s about raising brand awareness, and creating engaging and memorable content to be part of the wider social conversation. Ultimately, initiating quick, relevant interactions that are seamless to share. GlobalWebIndex's Katie Young examines the opportunities for brands around the World Cup, and the role of social media in the shifting sports consumption landscape.